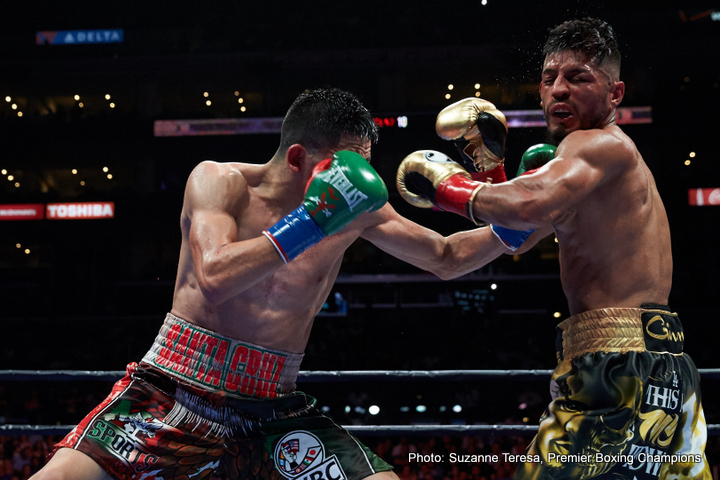 By Dan Ambrose: Despite taking a frightful beating last Saturday night to unbeaten former two division world champion Leo Santa Cruz (31-0-1, 17 KOs) in losing a 12 round majority decision, 29-year-old Abner Mares (29-2-1, 15 KOs) says he’s willing to get back inside the ring to face the likes of Santa Cruz again, or WBO featherweight champion Vasyl Lomachenko or former WBA Super World featherweight champion Nicholas Walters. It depends on who his adviser Al Haymon wants Mares to fight. Mares lost the fight to Santa Cruz by the scores of 114-114, 117-111 and 117-111. Mares was fortunate that the scores of the fight was even that close because you can argue that Mares should have lost by a wider set of scores. The 114-114 score reflected badly on the judge that scored it that way Max DeLuca. When you have an oddball score like that in a one-sided fight like we last Saturday, it just looks bad on the judge that scored the fight that way. I think it’s safe to say that Haymon won’t be throwing Mares into the ring with the Top Rank promoted Lomachenko and Nicholas Walters. Mares doesn’t need to worry about that happening. But he does need to realize that he doesn’t belong at featherweight, and if he chooses to stay in this weight class, then he’s going to watch his boxing career go down the drain quickly. The size difference between him and Santa Cruz was substantial last Saturday night. Mares will have that same size problem when he gets in the ring with the other top fighters at 126. He doesn’t match up well against someone like WBC featherweight champion Gary Russell Jr. If that’s Haymon’s next plan for Mares, then he’s marching him down the wrong path. Mares can certainly fight Santa Cruz again for another payday fight, but I don’t expect the outcome to be any different than it was the last time. If the goal is to have Mares winning his fights instead of taking beat downs in losing, then he needs to move down to at least the super bantamweight division if not the bantamweight division. Mares’ lack of size won’t be as dramatic at 122 compared to the 126lb division. But there are a lot of young fighters at super bantamweight, and the only way I can see Mares winning a title is if he goes after the WBC super bantamweight strap. Mares won’t beat WBA/WBO 122lb champion Guillermo Rigondeaux, and he won’t beat WBA champion Scott Quigg and IBF champ Carl Frampton. Those guys either have too much power or too much speed for Mares. Frampton and Quigg have a lot less ring wear on them than Mares, even though both guys aren’t that much younger than him.